Just about every kid I know enjoys riding a bike. Some take to it quickly, and others more slowly. But once they get the hang of it and gain some confidence, riding provides a tremendous sense of freedom for kids. I still remember the first time I rode my bike to school. Man, what a feeling! A group of us from the neighborhood would gather almost every afternoon and ride through the old Civil War trenches on our BMX bikes. I only wish someone had introduced me to mountain biking back then. My father didn’t really ride anything other than his old cruiser bike, which he would take for a spin around the block every now and then. Of course, back in the seventies and eighties, mountain biking hadn’t gained the popularity it has today. There is much more awareness and opportunity now with Richmond and the surrounding counties boasting some fabulous trails for riders of all levels. My two kids haven’t taken to riding that quickly, but my son is starting to get interested in riding the trails, and it has been a real pleasure watching him gain confidence. I know there are a lot of parents out there who are intimidated to get their kids out on the trails because they don’t ride themselves, or they don’t know where to find trails that are right for the family. Having worked with a lot of kids, including my own, here are some things to know. When can kids start riding on bike trails? If your child can ride on the pavement without training wheels, she is ready to hit the trails. The key is to start with the easy stuff and build from there. One misconception is that mountain biking has to involve flying down steep hills and climbing up even steeper ones. Sure, it can, but there are plenty of places to ride on relatively flat trails, which is the ideal place to start. What kind of bike do we need? Just like cars and boats, there are plenty of options out there for mountain bikes. Yes, you can spend thousands on a bike, but you certainly don’t have to. Start with something more reasonable, and work your way up if you and your kids get more interested in the sport. Any of the bike shops in town can help get you set up with the right bike, both for your skill level and your budget. 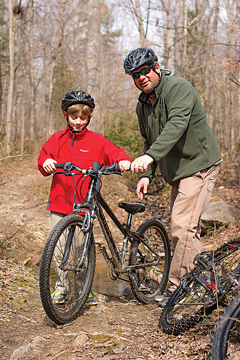 Not knowing where to go is perhaps the biggest obstacle for people who want to start mountain biking with the family. There is really no reason for that to be the case. You’ve made a great choice by reading this article for starters. Also, the Internet is a wonderful resource with sites where you can find lists of most of the trails in the area, trail ratings, and even the conditions of the trails. The biggest thing to consider when choosing trails for the kids and the family is taking it easy and working your way up as you and your kids get more confidence. The trails of the Wetlands in James River Park are the perfect place to start. These can be accessed from the Pony Pasture parking lot. There are a series of wide trails that are ideal for getting a feel for riding in the woods on flat ground. Everything loops back around so you can ride as long or as little as you want and be back at the car in a few minutes when you are ready to call it quits. Deep Run Park in Henrico is another great place to start with a wide beginner loop around the family-friendly park. Belle Isle is a great option as you and the kids are ready for a bit more of a challenge. I recommend riding over from the Reedy Creek parking lot on the south side of the river. The Belle Isle Bike Skills Course is the perfect place to begin working on skills. What’s called the Lost Trail by insiders starts out of the back of the skills area and loops around the eastern portion of the island. This is a fun, flat trail with a few more obstacles, but nothing too overwhelming. 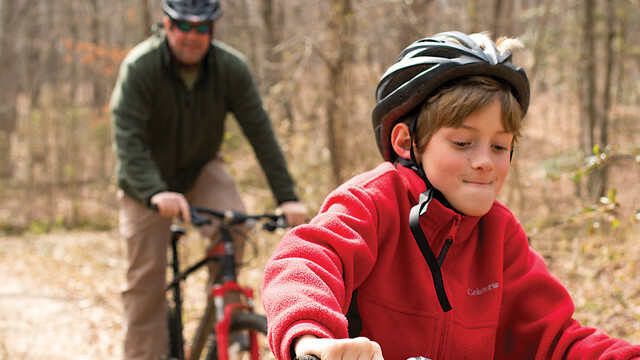 Pocahontas State Park is another solid option as your family of riders begins to develop skills and confidence. Designated as an International Mountain Bike Association (IMBA) Ride Center several years ago, there are miles and miles of new trails for all levels of riders. Most of the trails you will ride are multi-use trails, meaning you are likely to encounter people walking. It’s important to let your kids know this and to yield to other users, including hikers. If you are approaching someone from behind, let them know you are there. A simple On your right! or On your left! can go a long way to keeping everyone safe. Another thing to consider is the trail conditions. Don’t ride when the trails are too muddy. It’s bad for the trails and dangerous for the rider. Some trails will be closed with signs, but sometimes you have to make a judgement call for yourself. Always, always, always wear a helmet. Kids are used to it. They have grown up in a world of helmets. Adults should wear them too, even if we didn’t grow up in the helmet era. Not only is it safer, but it models the right behavior for the kids. Go at your own pace. I always tell my kids and the kids I work with, there is nothing wrong with walking your bike if you don’t feel comfortable with a particular section of trail. If you are always walking, then you are on the wrong trail. But if it’s fifty yards and then back on the bike, no big deal. It’s a lot better than getting in an uncomfortable situation. They will ride it when they feel comfortable, and it usually won’t take too long. Mountain biking is one of those things that can be a little intimidating as a family activity at first. But if you start with the appropriate trails and work your way up, you will find it’s a perfect way to get outside and see some of the city and surrounding areas you haven’t seen before. It’s great exercise, and instills a lifelong skill set. Next articleIs It Mortgage Time?